Assorted red orange Czech glass beads are used in this ID Badge Lanyard perfect for a teacher gift. 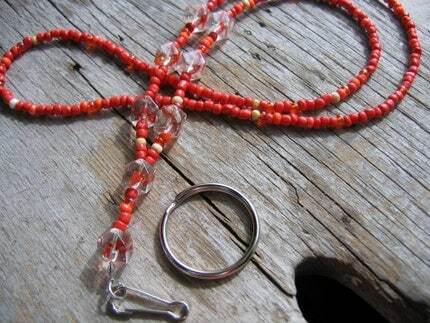 Larger clear beveled glass beads have a matching orange ribbon inside toward the bottom of the lanyard. The lanyard measures 16 inches to the end of the last clear bead, leaving hanging room for the badge. Your choice of silver ring or hook is provided at no extra cost. Ideal teacher gift whose school colors are orange. Don't forget the professionals in your life that also need badge ID lanyards.